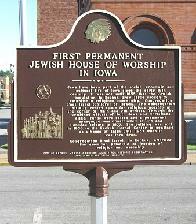 In the 1880's, Keokuk, Iowa was home to the largest Jewish community in the mid-west. Jews have been part of the social, economic and cultural life of Iowa since the early 19th century. It was not until 1855 that the Jewish population in Keokuk grew large enough to establish a religious community, Congregation B�nai Israel ( Children of Israel). The congregation initially rented space for religious worship at the corner of Main and 7th streets. 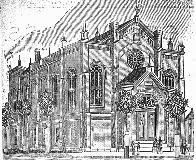 Through the combined efforts of both Jews and Christians alike, funds were raised and a permanent synagogue was constructed at 8th and Blondeau streets in 1877. The building was sold, in 1938, to the Keokuk Gospel Center to continue as a house of faith until 1957 when it was torn down. Congregation B�nai Israel, in Keokuk, affirmed the American principle of freedom of religion and assembly. City of Keokuk, Jewish American Society for Historic Preservation, Iowa Jewish Historical Society.